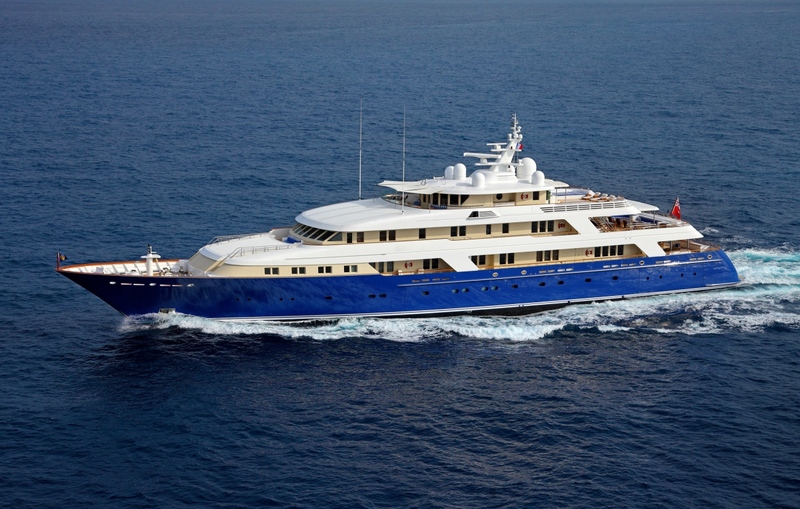 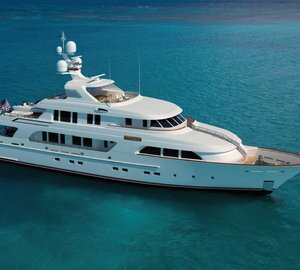 Built by Delta Marine in 2006 and last refitted in 2016, this 73m classic custom superyacht features the exterior styling of Delta Design Group while her interiors are the work of Donald Starkey. 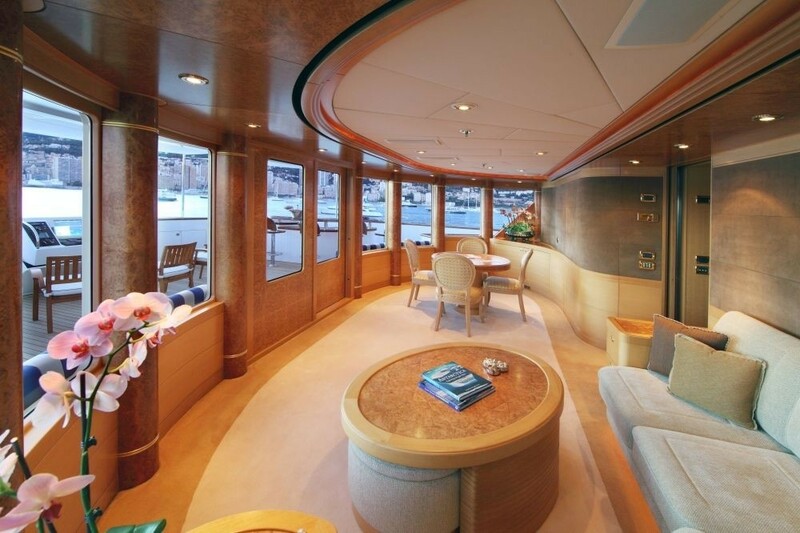 Built with a steel hull, she was the first yacht to be built with a composite superstructure. 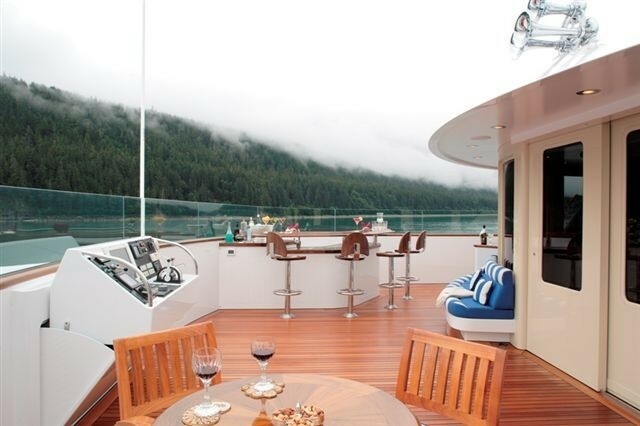 The accommodation sleeps up to 12 charter guests over seven beautiful cabins and is ideal for either family vacations, yacht charter getaways with friends or corporate events. 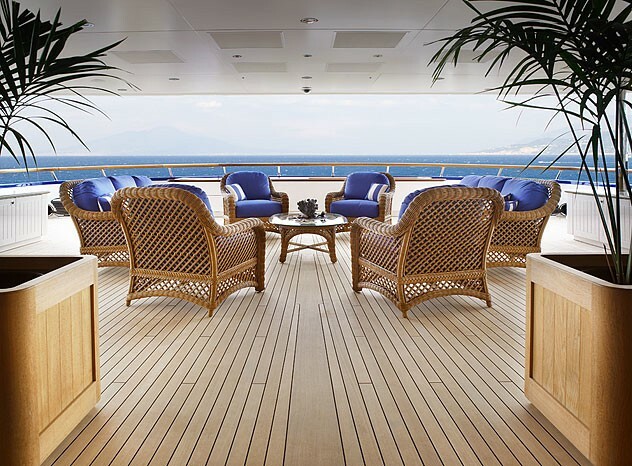 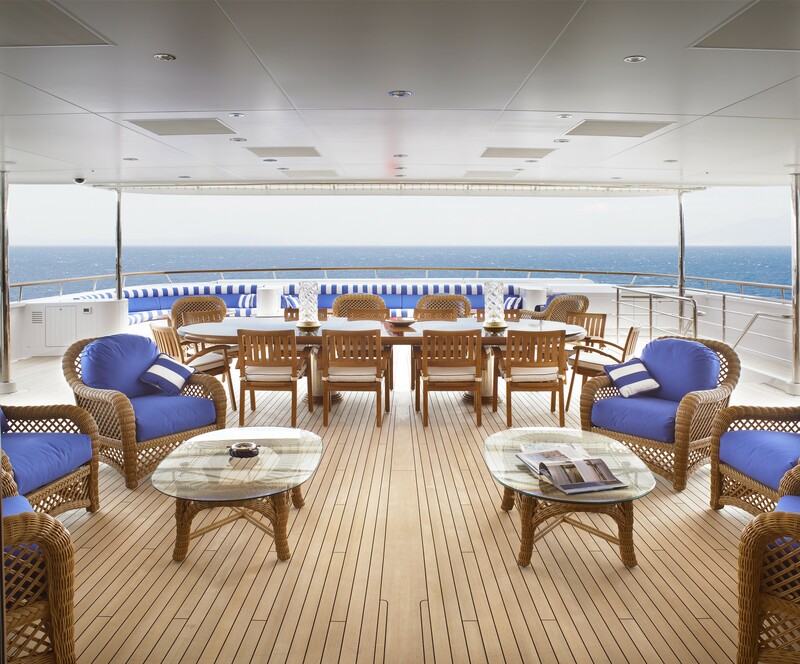 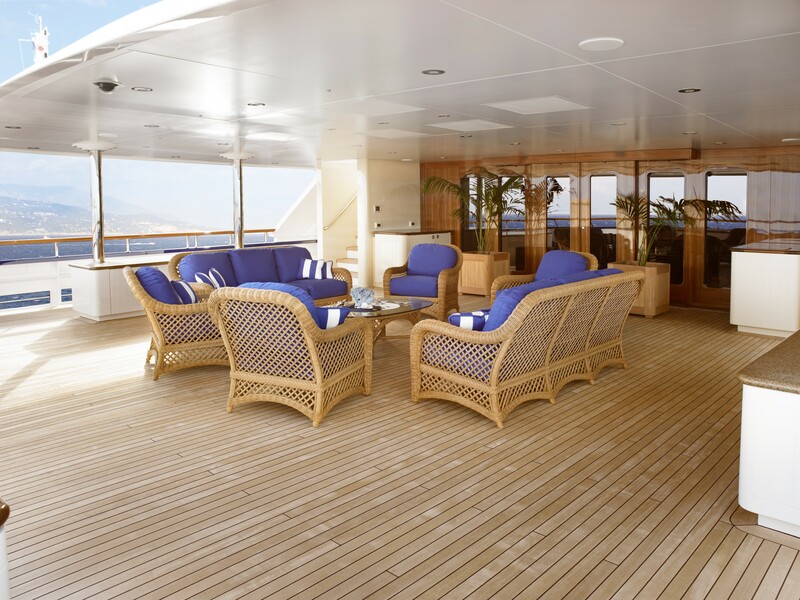 The main deck aft offers guests a large space for lounging outdoors with free-standing sofas, armchairs and tables perfect for morning coffee and casual alfresco meals. 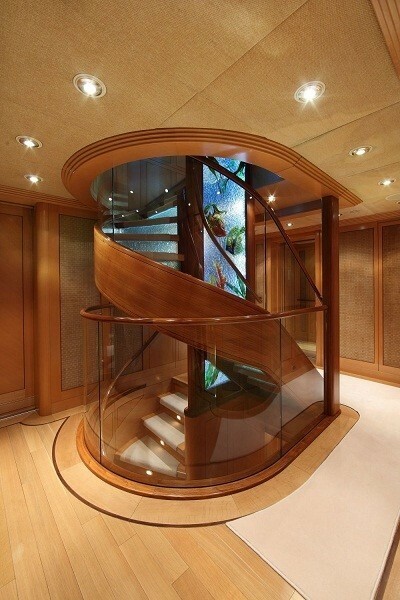 A staircase leads down to the beach club, where the transom door opens out to create a large swim platform for sunbathing and accessing the tenders and toys. 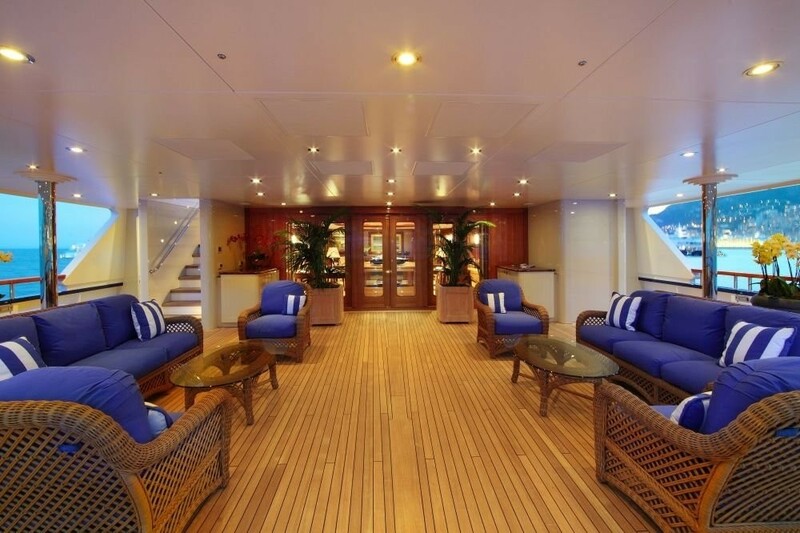 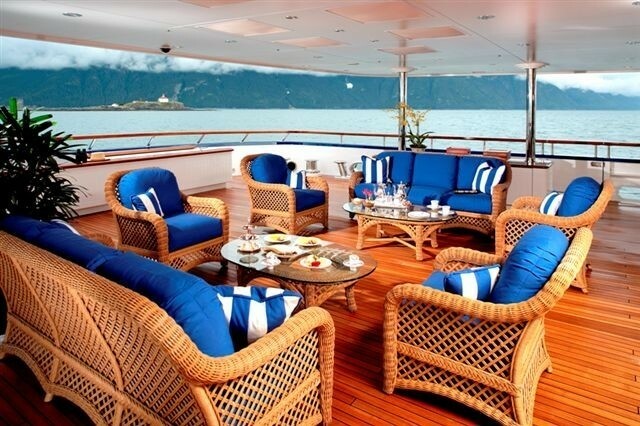 Guests also have the option of using the seating on the bow for a quiet and private place to rest. 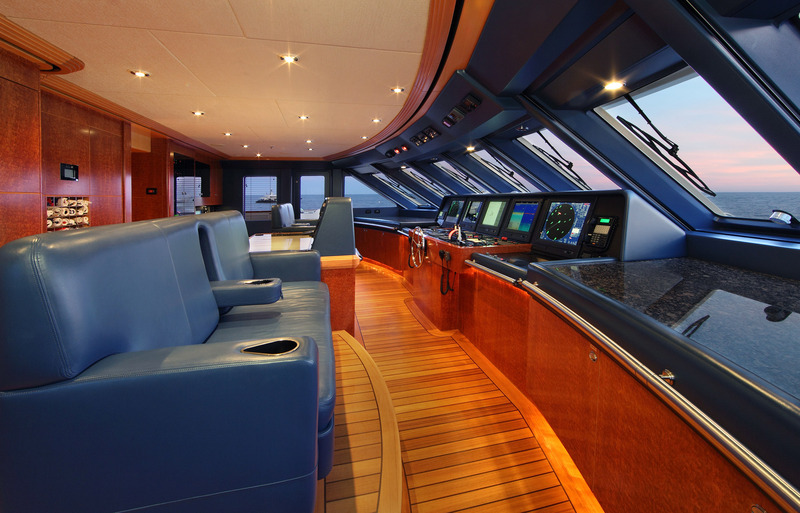 Staircases connect to the upper deck, where there is a settee placed in front of the helm station for taking in panoramic forward views. 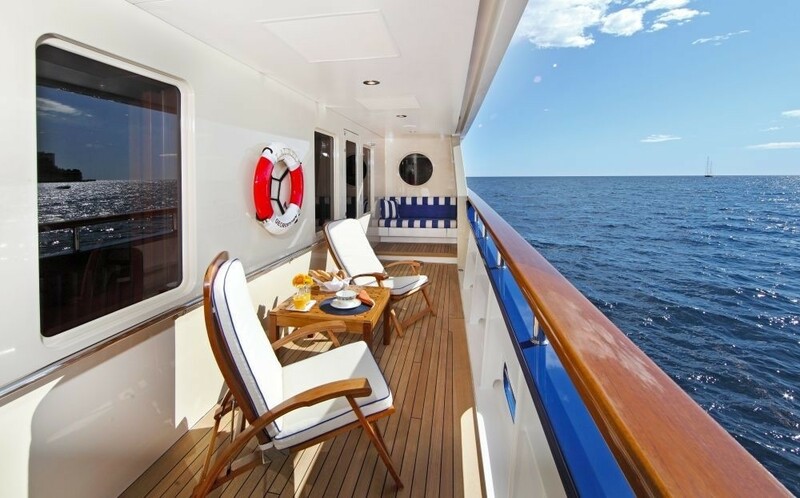 The upper deck aft is perfectly laid out for alfresco dining and socialisation, with an abundance of over-stuffed armchairs placed close to the skylounge doors and out in the sunshine beside the stern sofa. 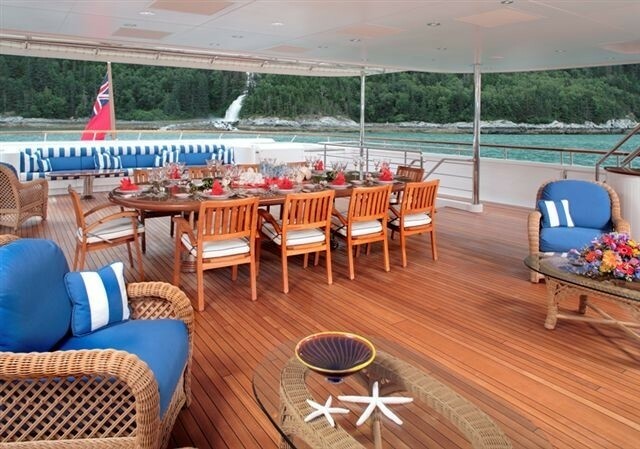 The alfresco dining area has classic styling for celebrating a special occasion in style. 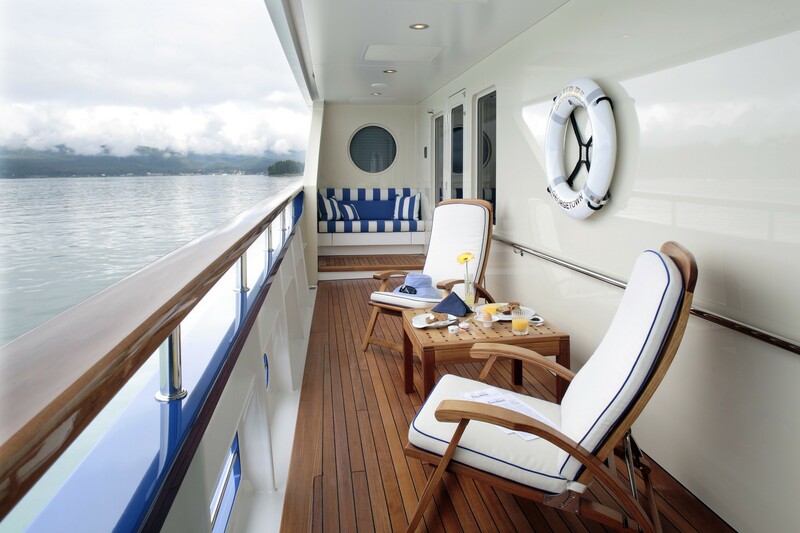 The sundeck forward is dedicated to relaxation and is fitted with a bar and plenty of armchair seating. 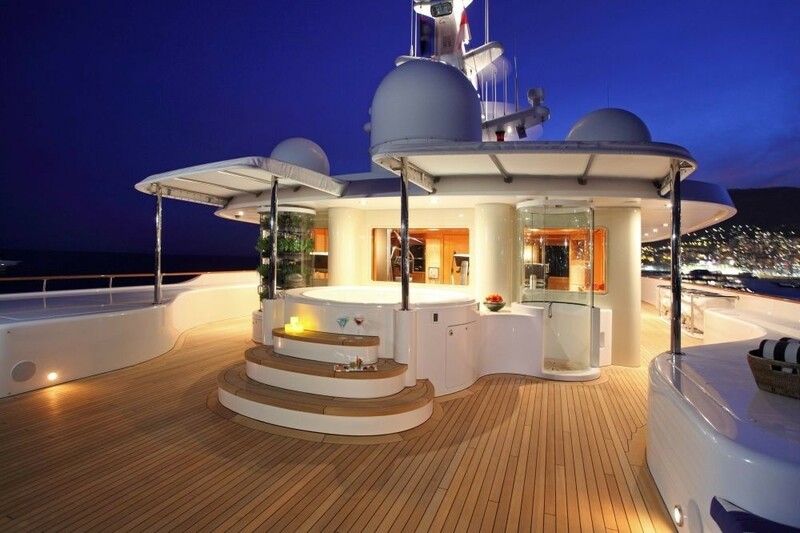 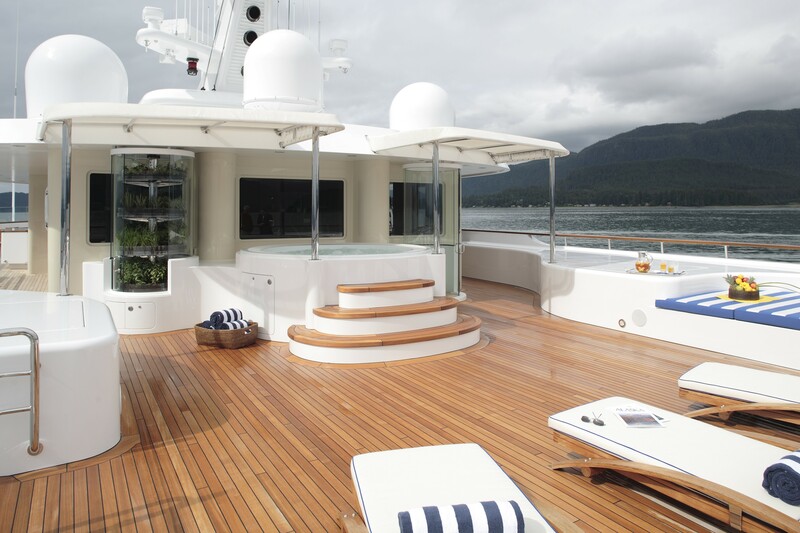 To the aft, the Jacuzzi is placed in the shade while along the stern there are numerous sun loungers for guests to unwind together and enjoy the views. 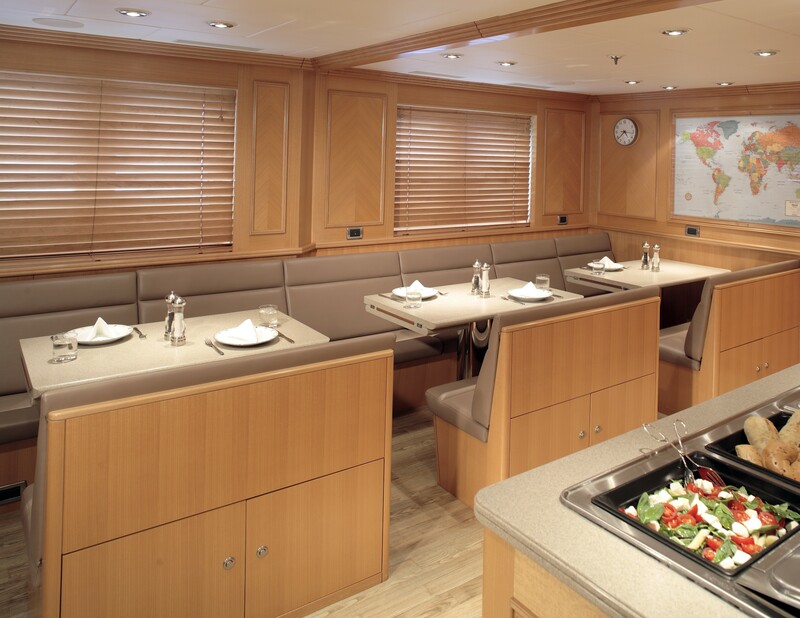 The lower deck layout has a spacious beach club to the aft, forward of which is the tender garage where port and starboard side hatches allow for easy launch and retrieval of tenders. 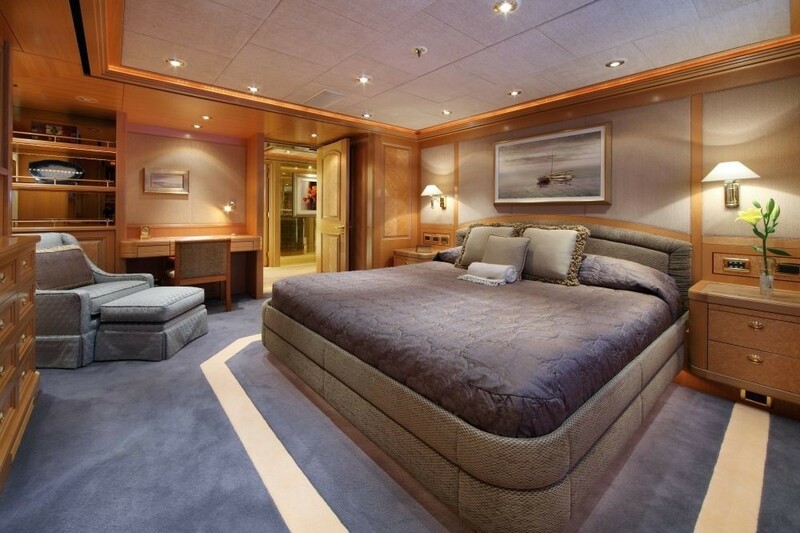 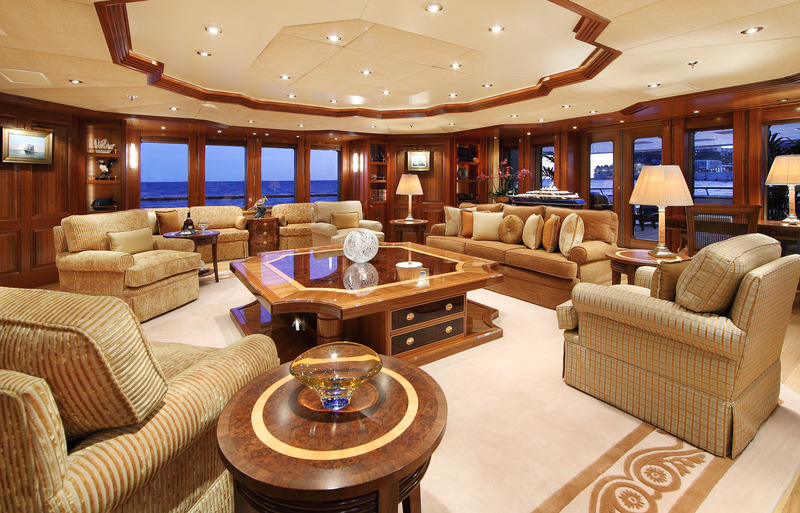 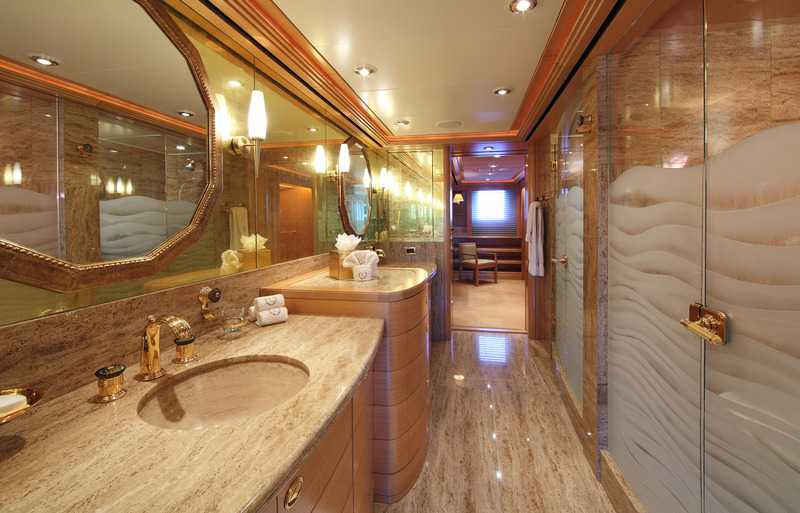 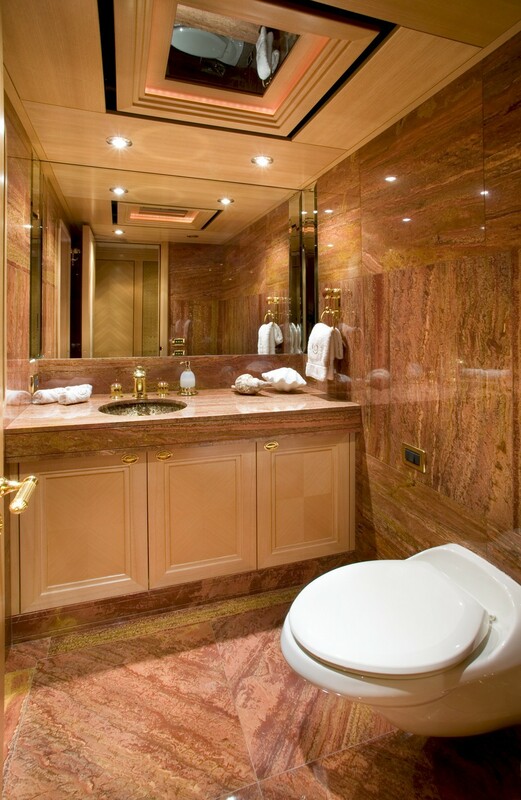 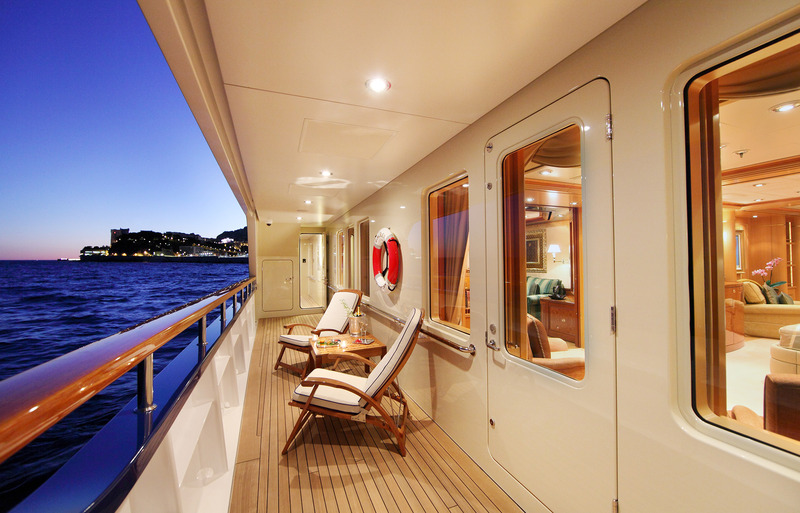 The engines take up the space available amidships and the lower deck forward contains the guest accommodation. 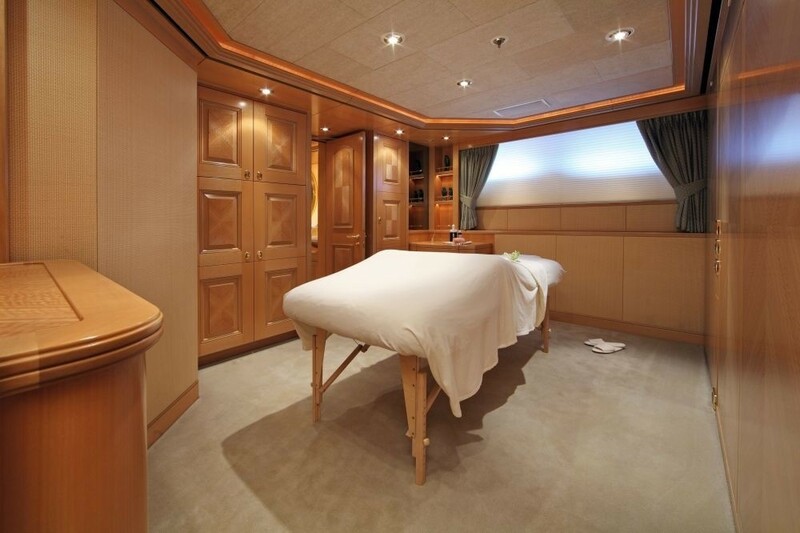 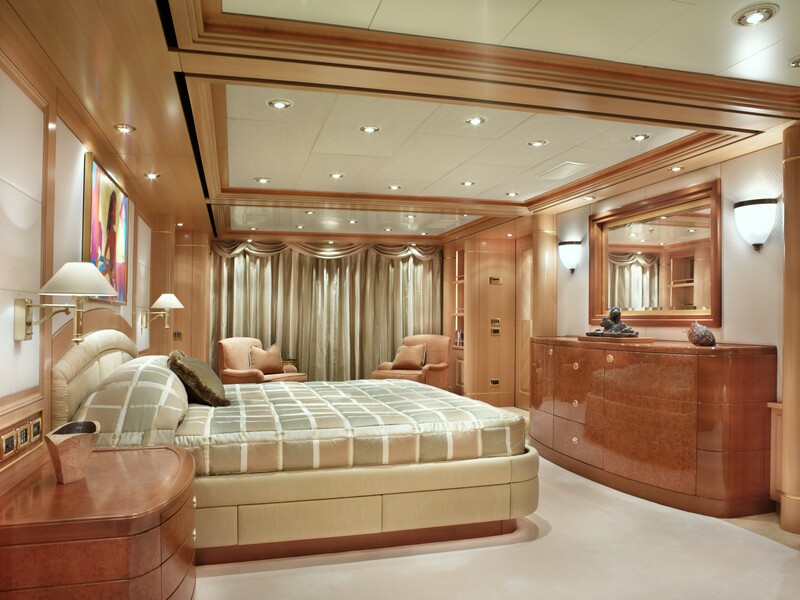 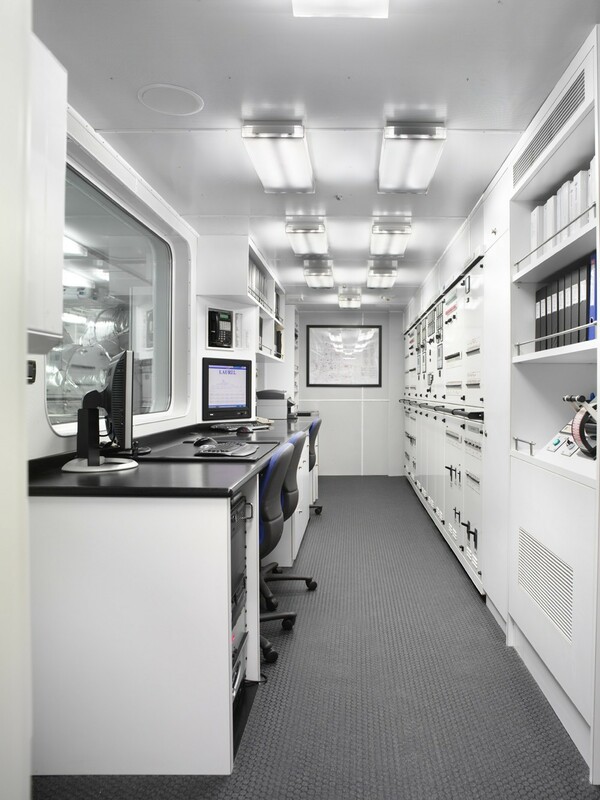 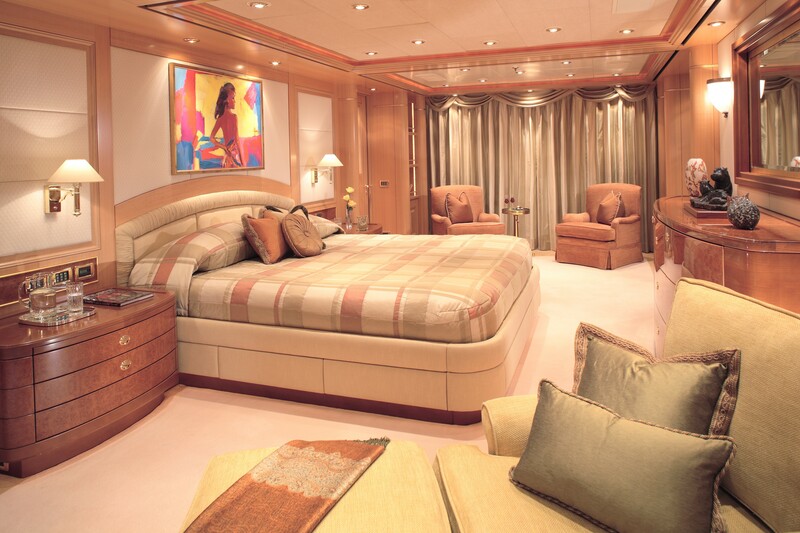 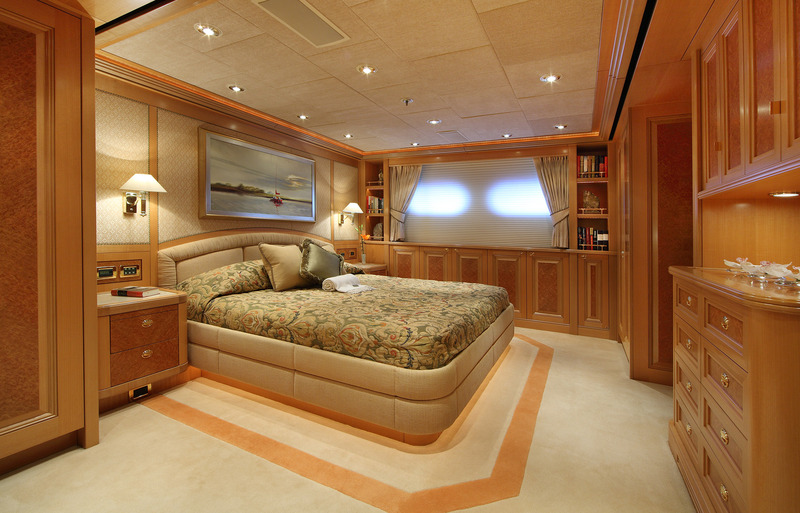 One of the rooms can be converted into a massage therapy room (Note: A masseuse is not part of the crew and will need to be hired at extra cost). 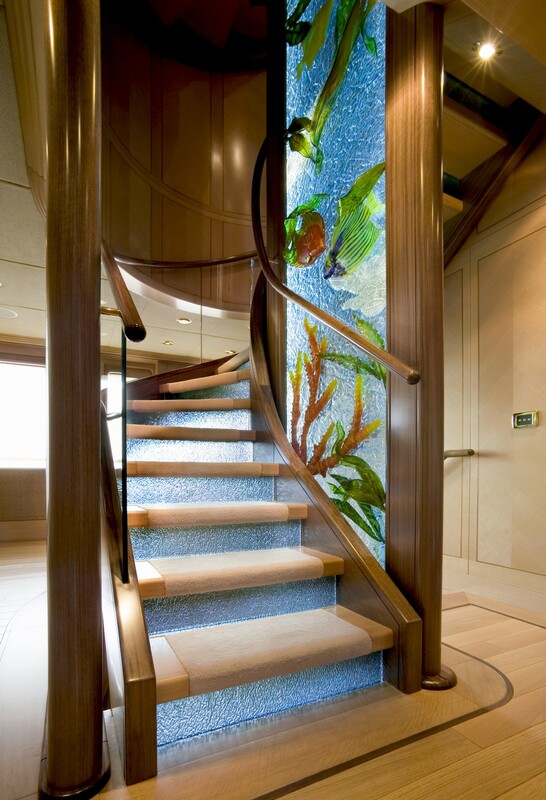 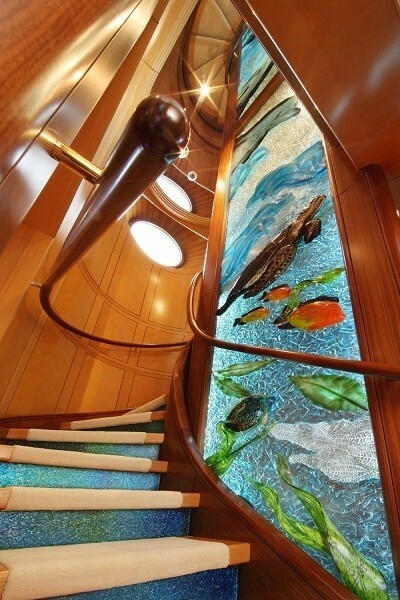 Connecting the decks is a spectacular staircase featuring glass artwork that spans three storeys and comes from Seattle-based artist Mary van Cline. 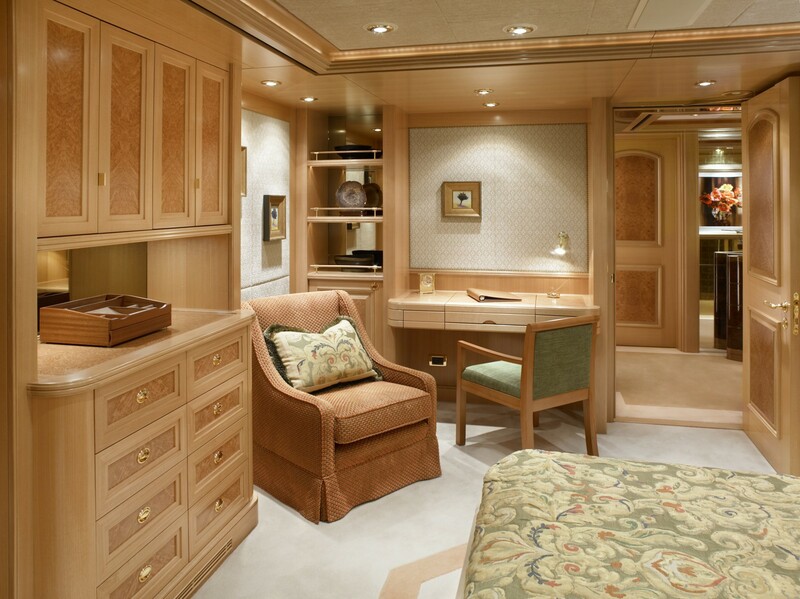 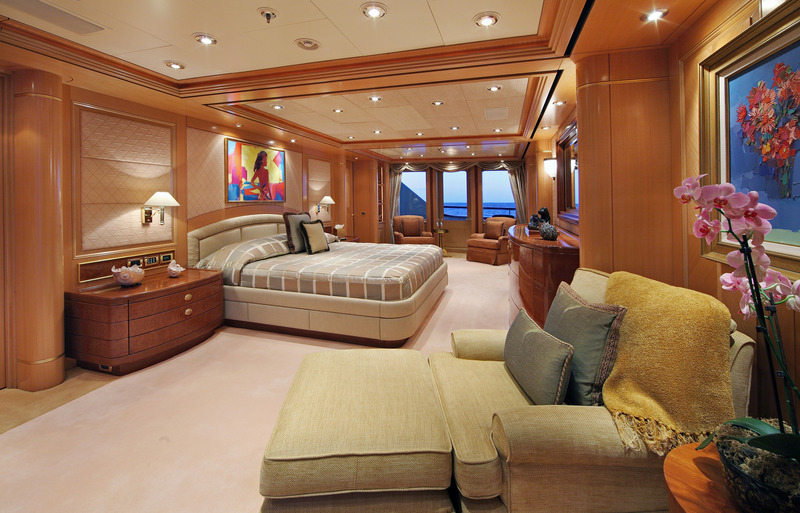 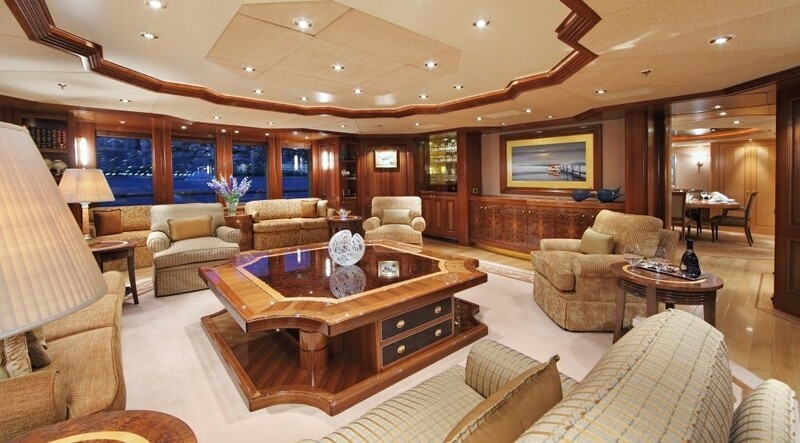 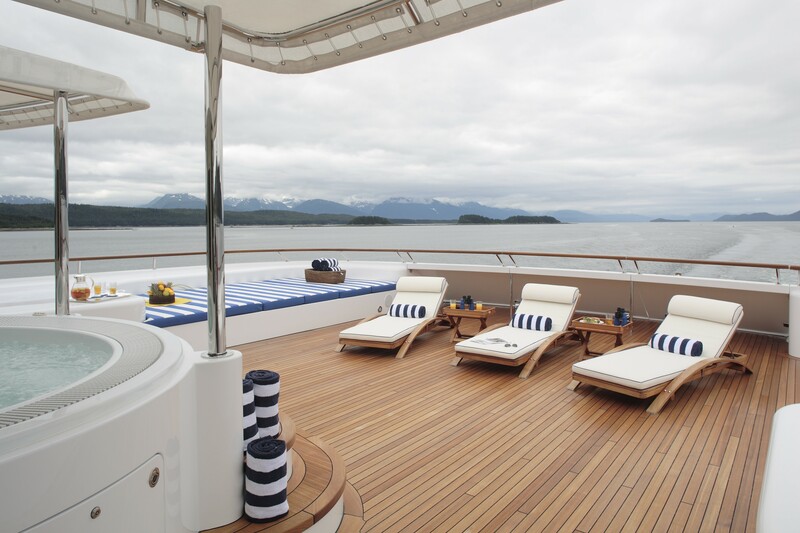 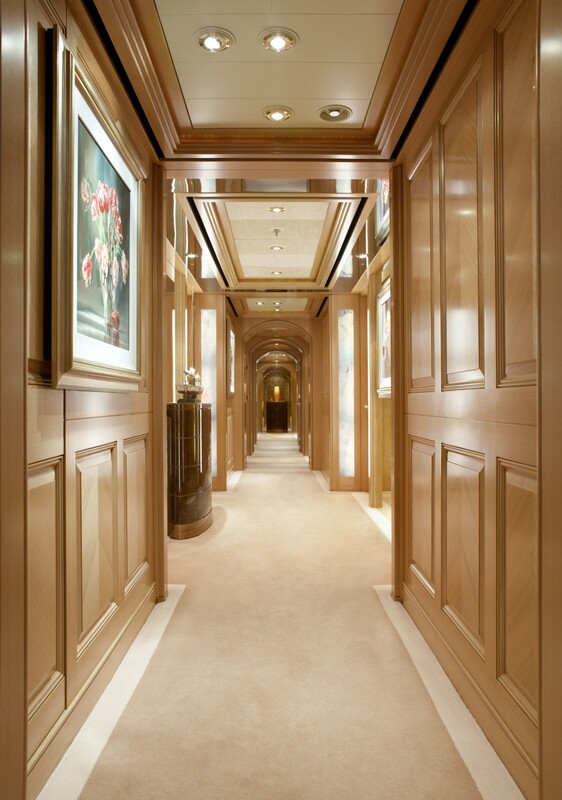 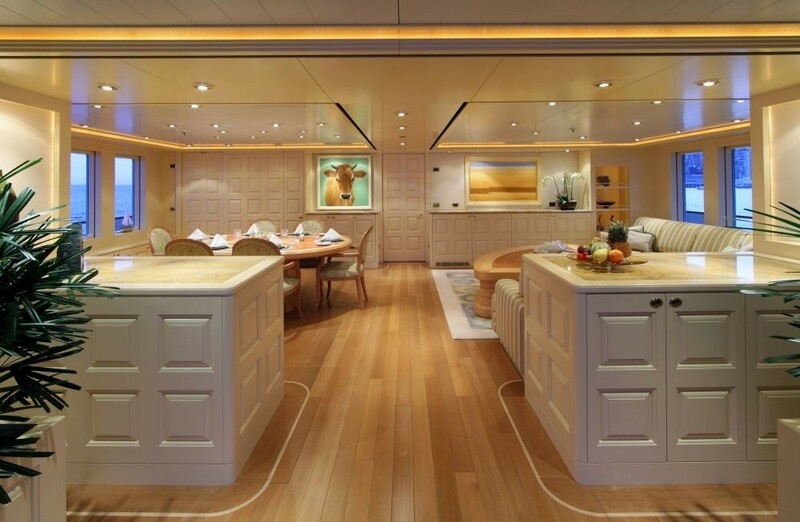 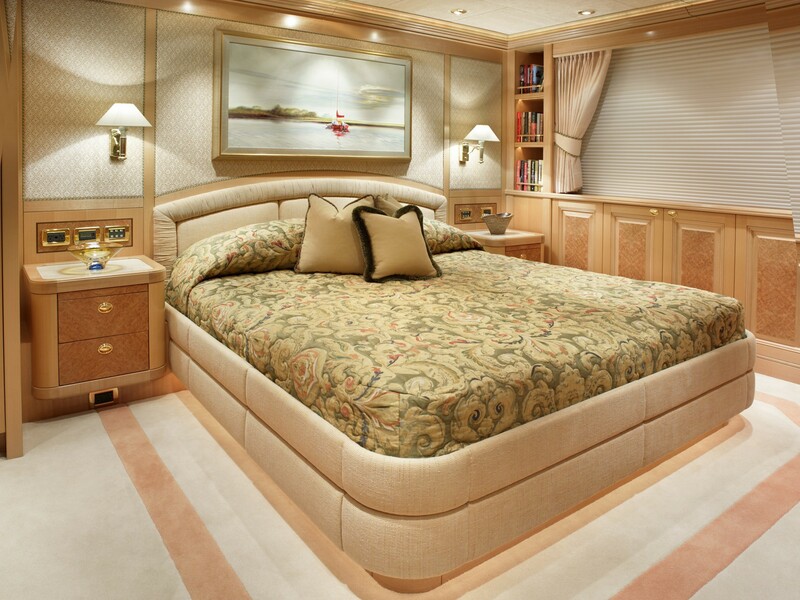 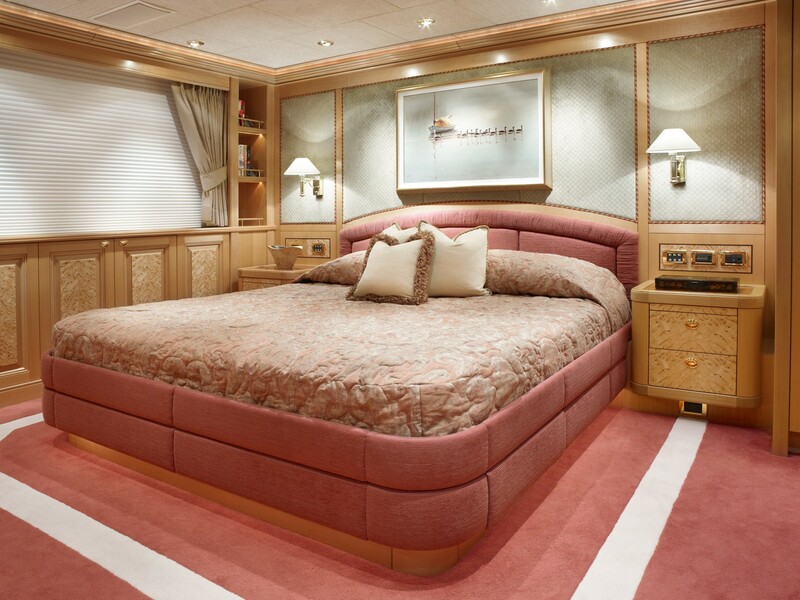 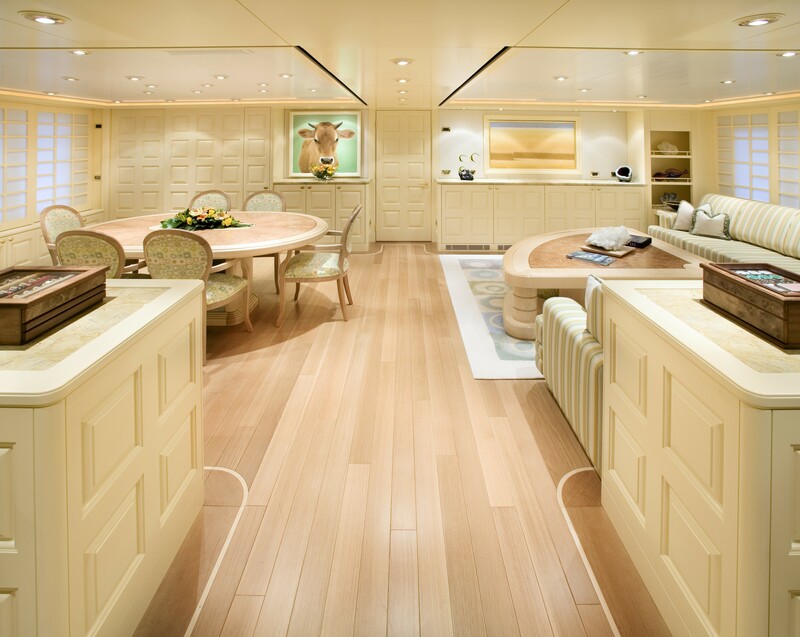 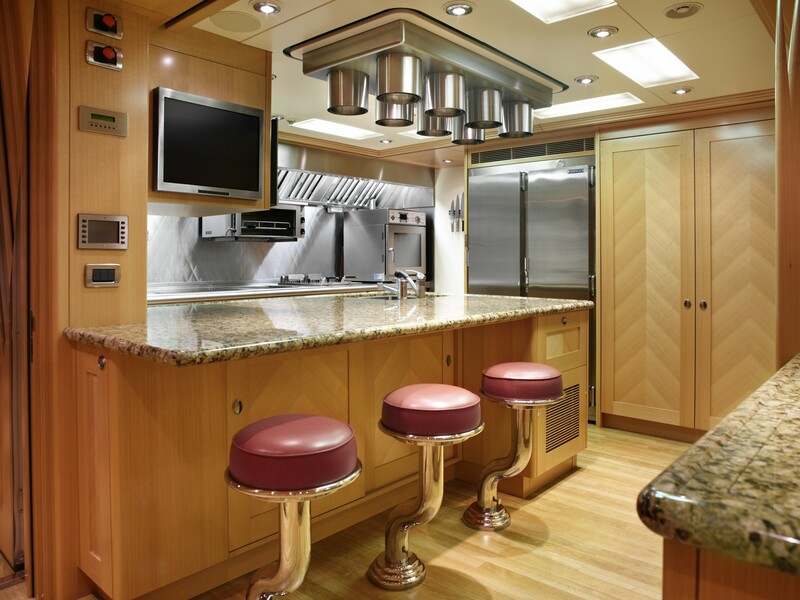 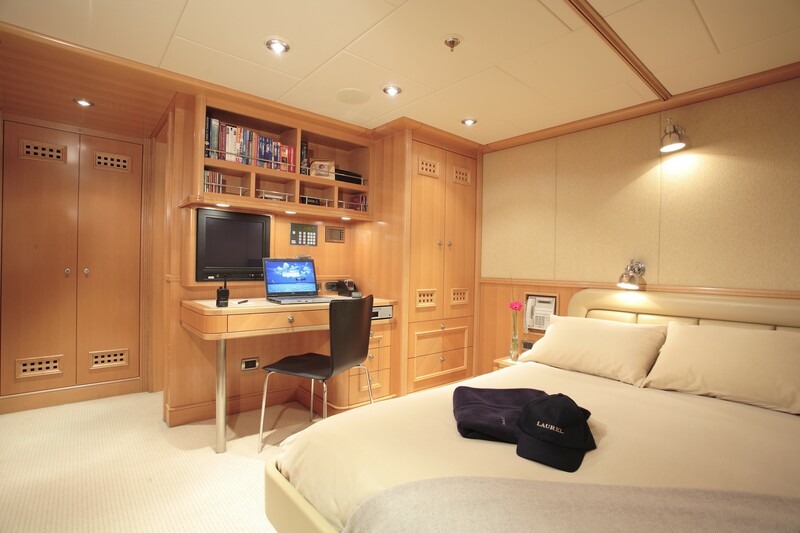 On the main deck, the forward section hosts the full-beam Master suite, which also has a study, day pantry, walk-in wardrobes and two private side-terraces. 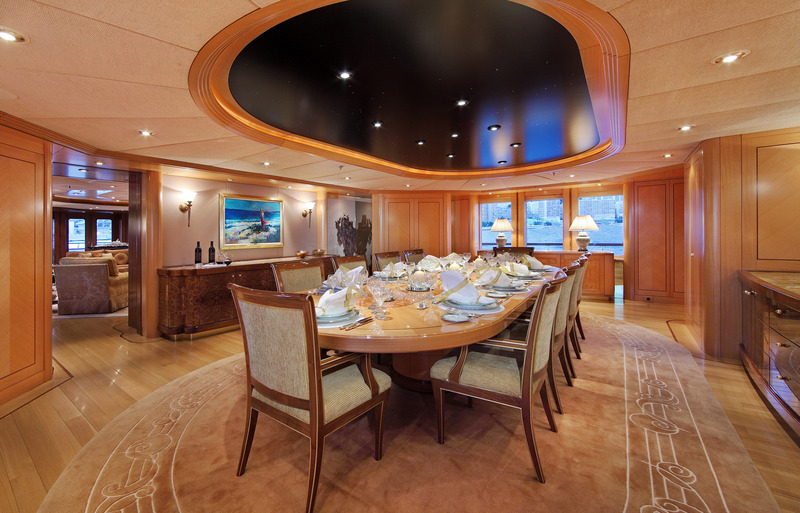 The main salon and formal dining area are furnished in anigré for a stately, timeless appearance with all the benefits of modern technology and comfort. 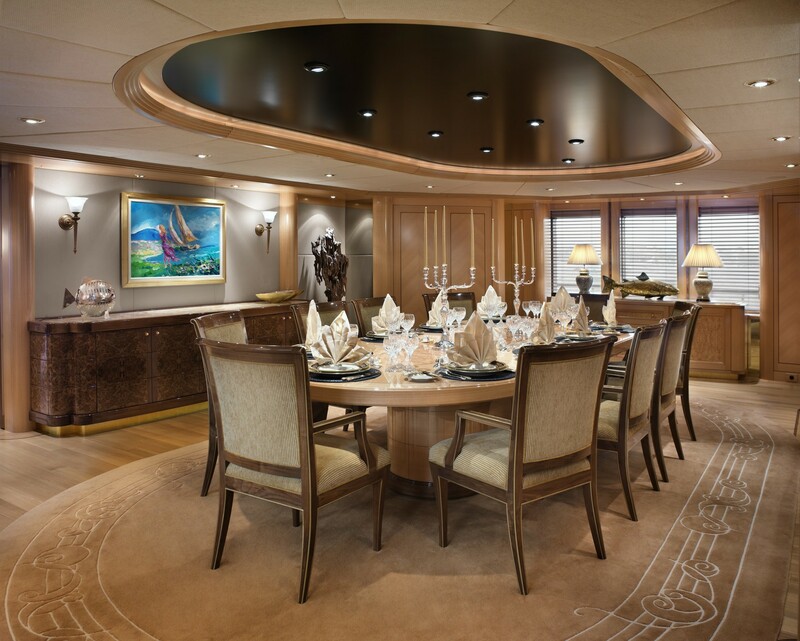 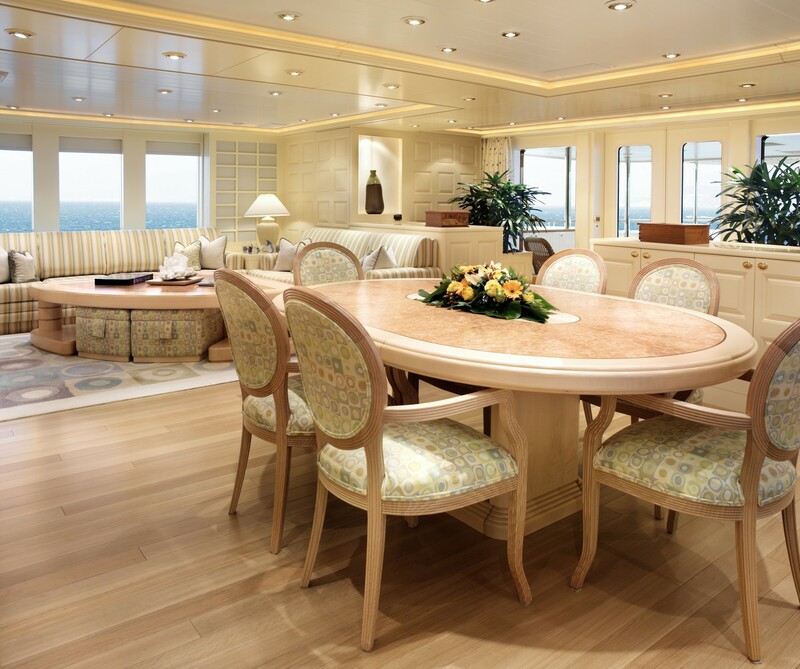 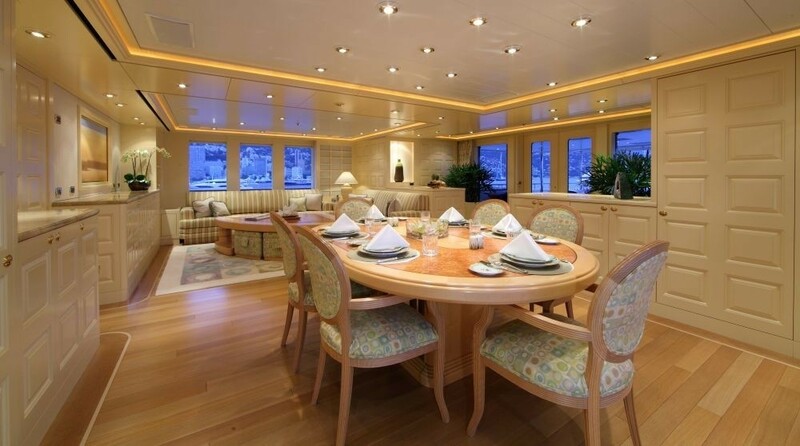 The formal dining area contains a grand oval dining table that is able to seat up to 12 guests, and the setting is divided off from the lounge for a more intimate atmosphere between guests. 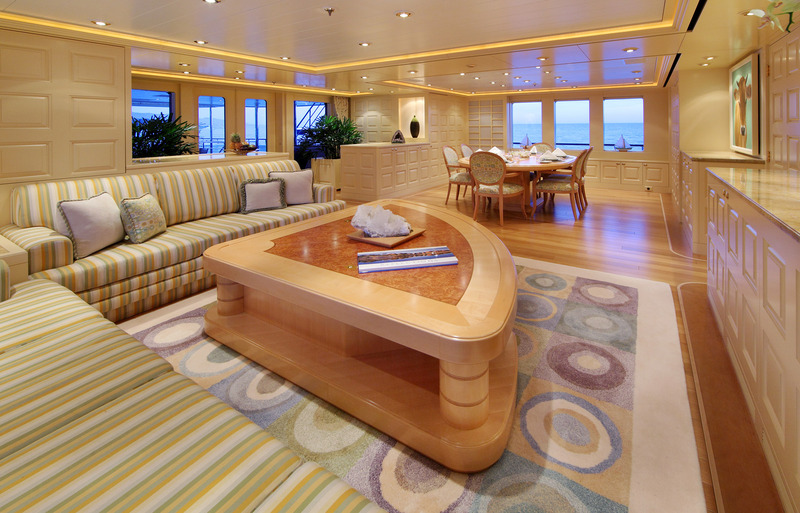 After dining, the main salon is a relaxing environment where the sofas and armchairs are arranged loosely around a square coffee table, allowing guests to spend time in separate conversations while remaining close to the main group. 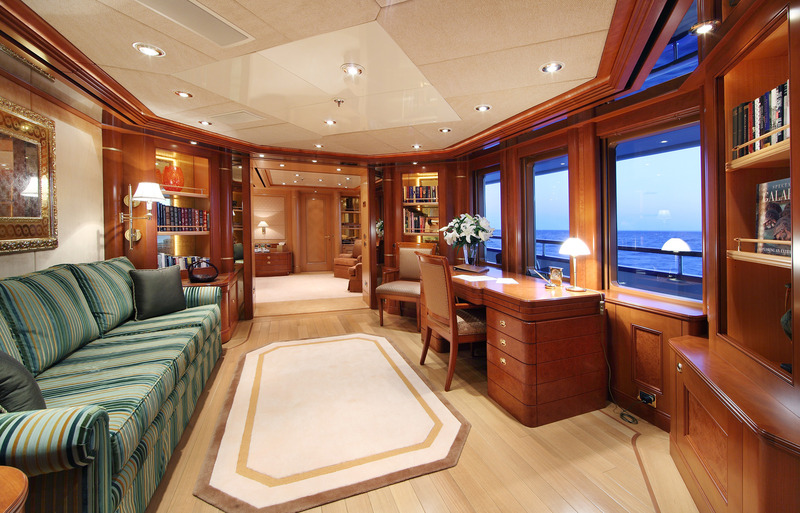 Large vertical windows are broken up by wooden frames enhance the interior elegance and let the natural light pour through from the port, starboard and aft. 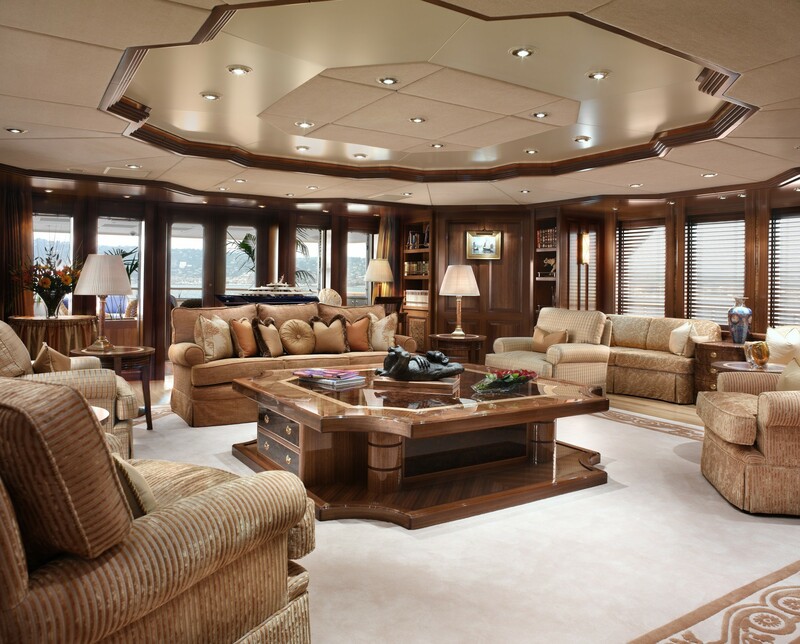 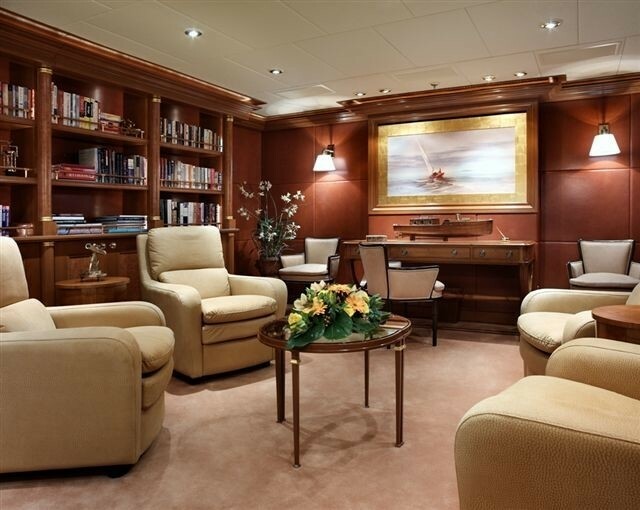 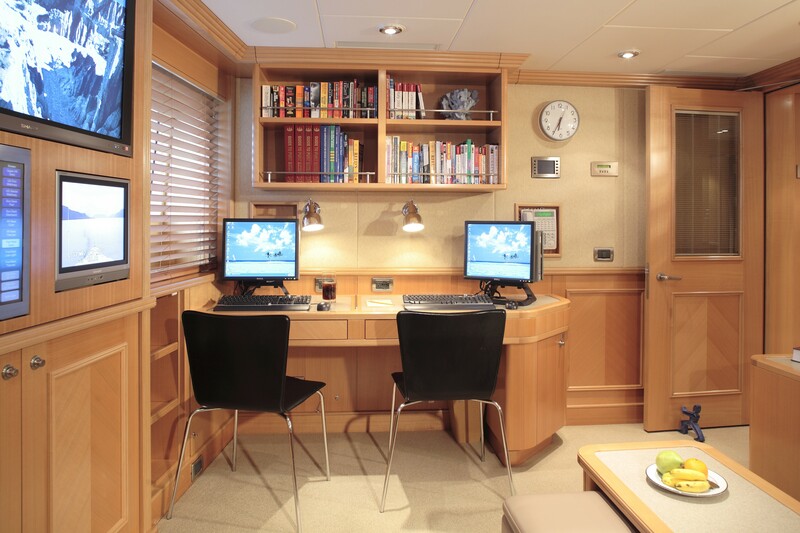 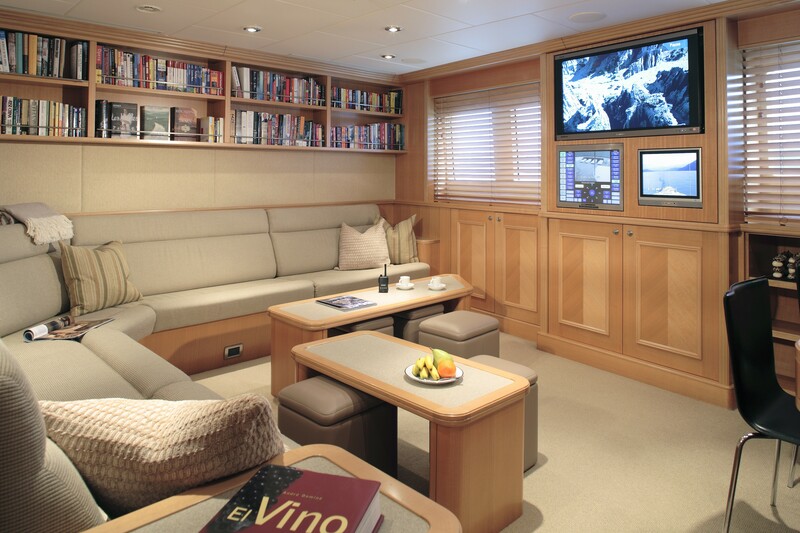 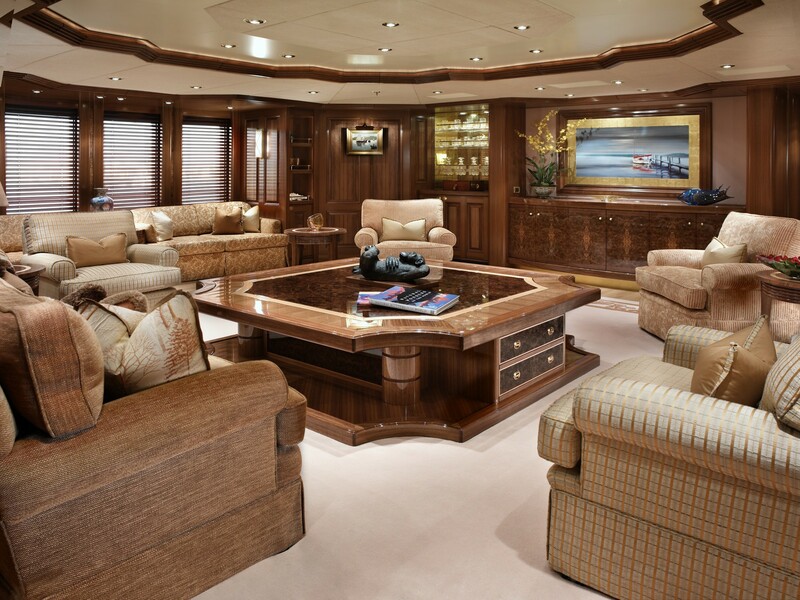 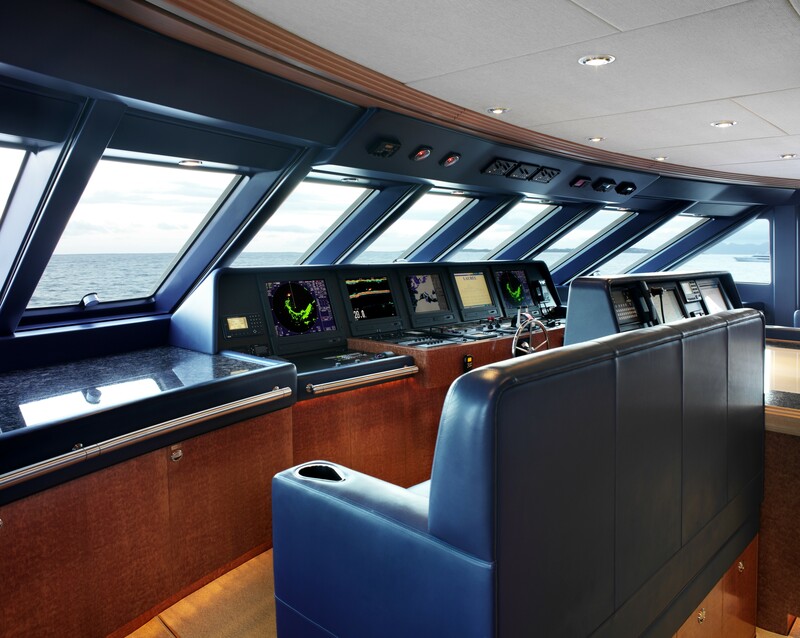 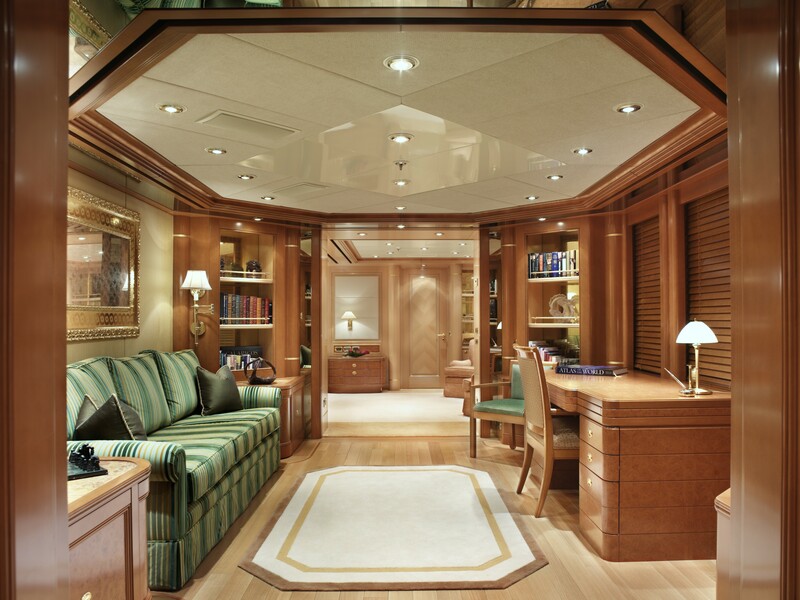 The upper deck forward contains the helm station, behind which is a media room that can also be used as a library or private study area. 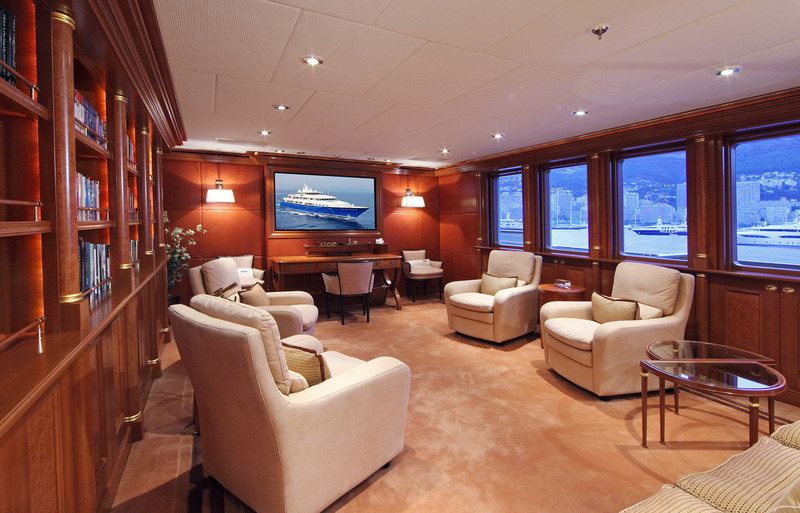 To the aft, the glamorous skylounge offers an alternative entertaining area to the main salon with a lighter colour scheme and painted panelling for a more casual social environment. 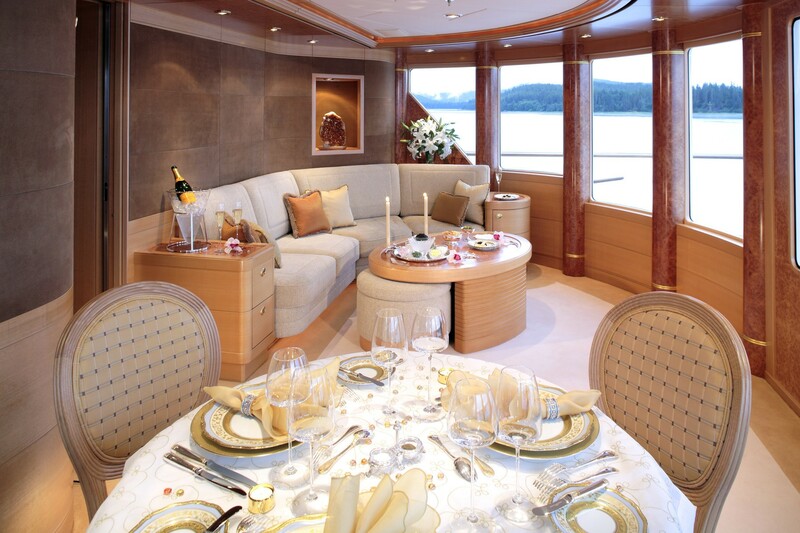 As well as an L-shaped lounge with semi-circle coffee table, there is a dining area to seat up to six guests. 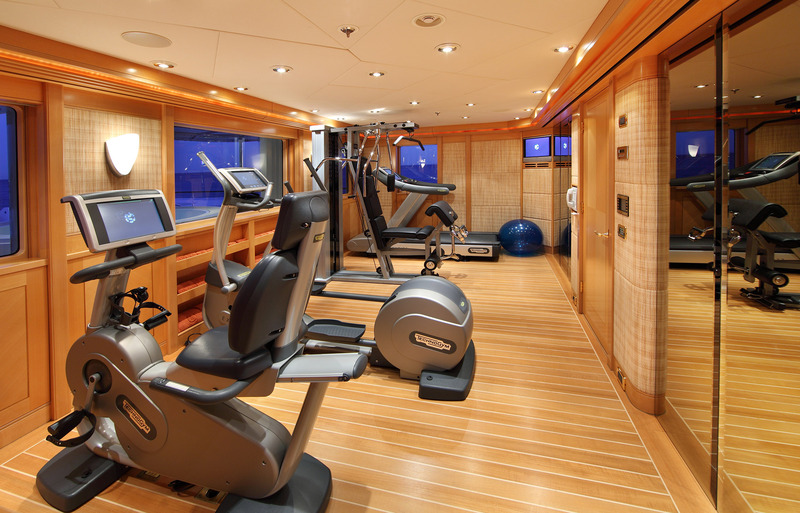 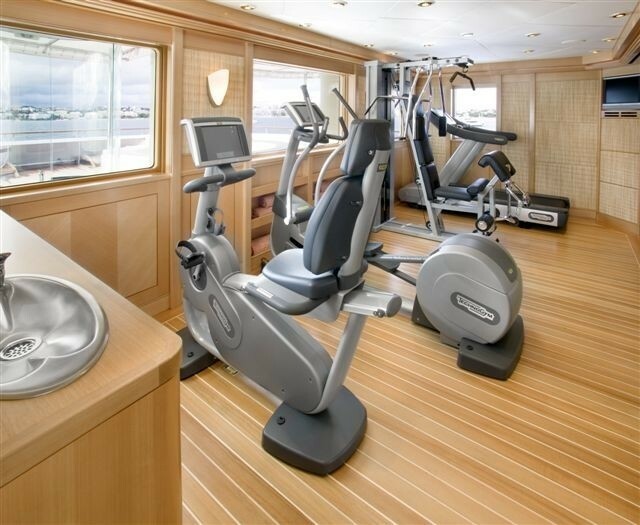 On the sundeck, the aft interior contains a spacious air-conditioned gym fitted with a range of exercise equipment for maintaining a fitness regime. 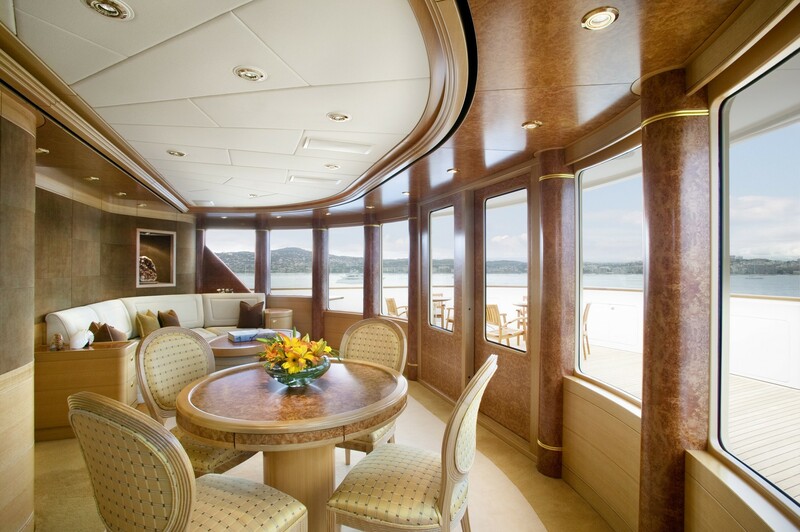 The forward interior is an observation area where guests can take in the panoramic views at any time of the day, in any weather. 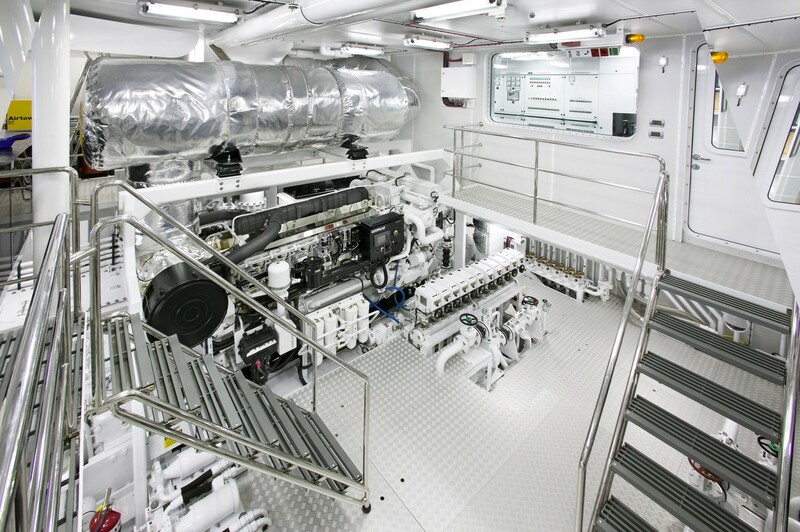 2 x Cat 3516B engines each producing 2,500 HP for a top speed of 18 knots, a cruising speed of 15 knots and a range of 6,000 nautical miles. 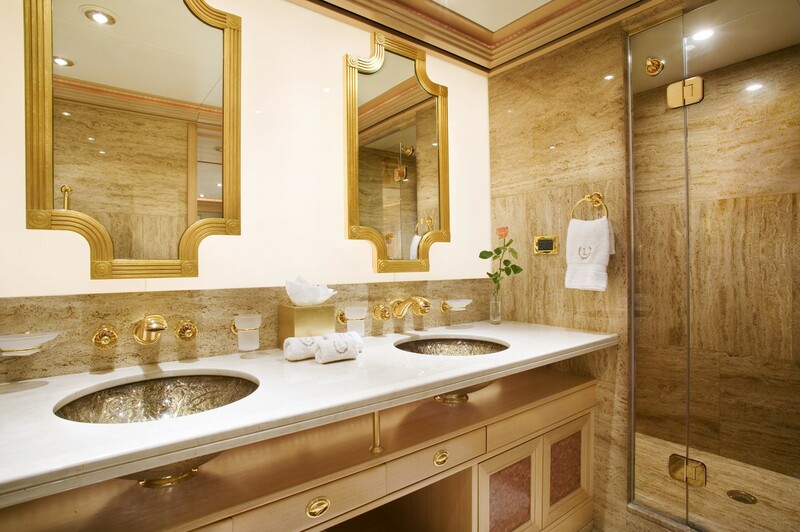 The accommodation sleeps a maximum of 12 guests across 7 en-suite cabins: 1 Master suite, 5 double cabins and 1 twin cabin with a Pullman berth. 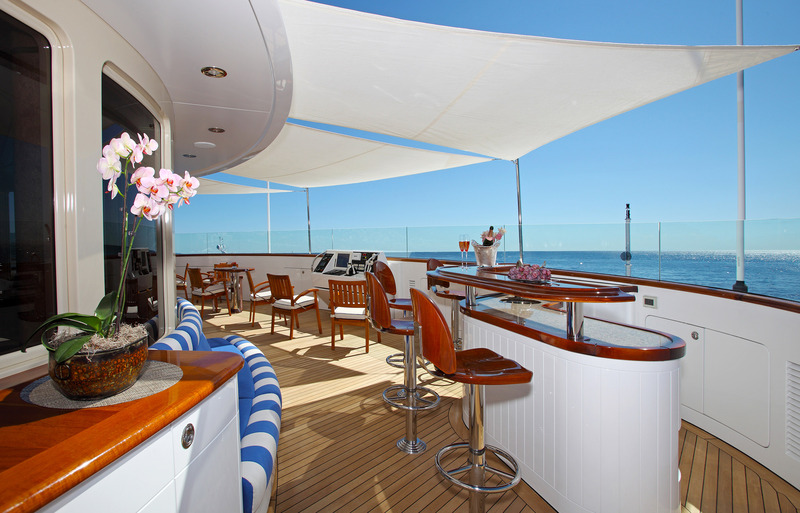 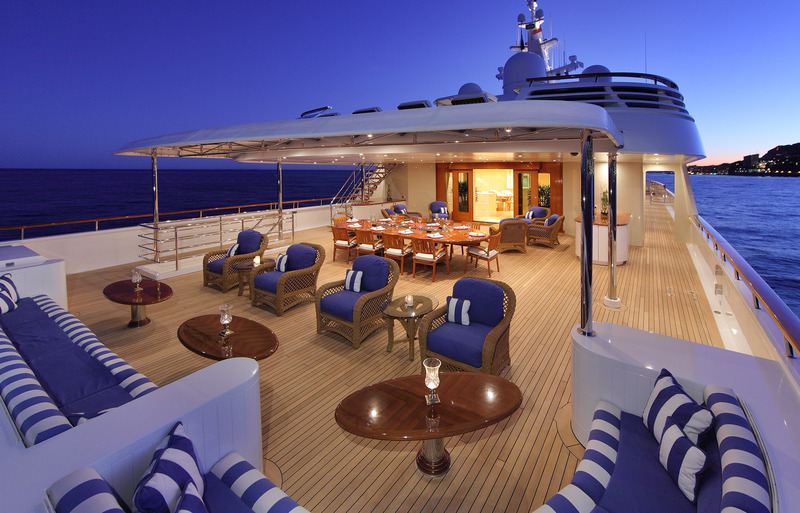 The crew of 22 will ensure that everyone on board has a fantastic cruising experience.